Learn what transactions Kashoo automatically creates at the end of every fiscal year. Did you know that your accounting records have a birthday every year, just like you? At the end of your fiscal year, Kashoo will celebrate this special occasion by creating some year-end adjustments. Kashoo automatically makes adjustments on the last day of your fiscal year, moving the amounts from your income and expense accounts to the retained earnings account. Why do such a thing? Your profit and loss (Income Statement) is calculated on a yearly basis, just like your income taxes, so it needs to start from scratch every new year. Since income and expense accounts make up the Income Statement report, these are the accounts that need to be zeroed out. In accounting, every action has a reaction, so you can not just delete the amounts in the income and expense accounts. Instead, you have to move those amounts somewhere, and that somewhere is the retained earnings accounts. Retained earnings is exactly as it sounds. It’s the earnings (or losses) a business has retained year over year. 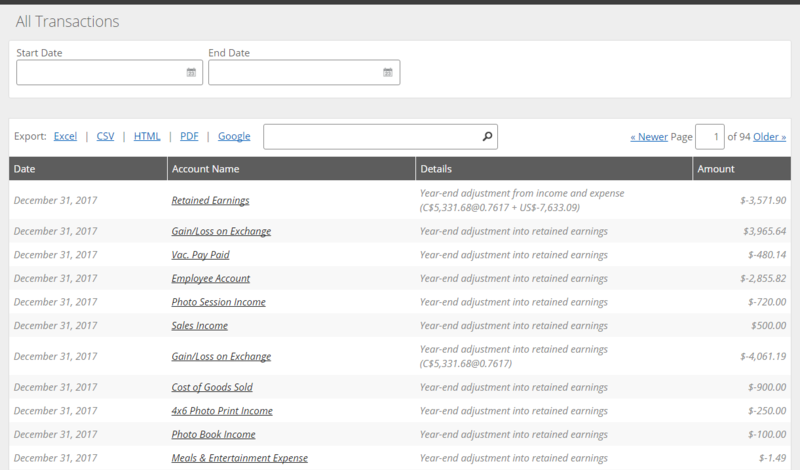 One thing you will notice if you go to the All Transactions section in Kashoo, is that you will be able to see all the year-end adjustments into retained earnings before the year is even up. You can also see the Year-end adjustments if you go to the detailed view of any income or expense account (which you can do by going to the Accounts page and then clicking on an account). This is something that Kashoo automatically does to ensure that your records are always up-to-date. The transactions are dated the last day of the fiscal year, so as to not affect any reports from the current fiscal year. You will notice as the year’s progress, that these amounts automatically get adjusted. Even if you go back to a previous year to adjust an entry, Kashoo will automatically adjust that year and every year after for that change. Note: These are automatic adjustments that occur every year, so you will not be able to edit them.